Dix 61 built in Turkey by Ozcan Bilik. The client who commissioned this design had a racing background but wanted comfort to go along with a good turn of speed. He specified that his yacht have a schooner rig for ease of handling with a minimum of experienced crew and a deck saloon in preference to a pilothouse arrangement. 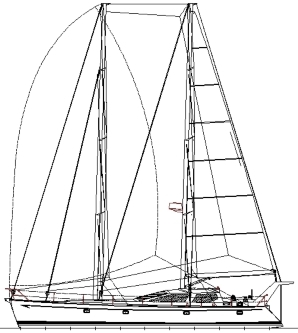 The resulting boat is modern in concept, with a fairly high but harmonious superstructure and a modern staysail schooner rig. Combine the small sails of the schooner rig with modern roller furling systems and you have a boat for which you do not have to be a gorilla to sail single-handed. The foremast has in-mast furling to cater for a fisherman or gollywobler, allowing a small crew to feel confident of using this big sail to full effect. The mainsail as shown is fully battened, to be used with slab or in-boom reefing but could be battenless for in-mast furling if preferred. 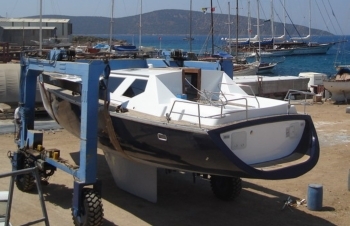 We have now introduced an alternative cutter rig, which was commissioned by a Turkish owner. This rig will give better all-round performance than the schooner rig but is less suited to short-handed sailing. Other features of the boat remain the same as with the schooner rig. The construction material chosen is sandwich GRP, using linear PVC core in the hull and balsa core in the deck. She can also be detailed for the alternatives of aluminium or "WEST" cold moulded timber if prefered. The hull has a relatively narrow waterline beam, clean undistorted underbody and well flared topsides. The bow is fine but has been shaped for good control offwind. Some top-end speed was given away in the shaping of the stern to make her quieter for occupants of the aft cabin on marinas. The plus side is that she will be a bit quicker in light conditions as a result. 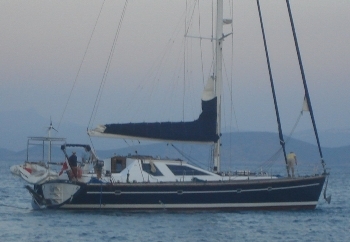 The deck layout is simplified by keeping halliards at the masts. The cockpit has primary and secondary winches on the coamings, from any of which the lines can be led to a central powered winch for lazy sailing or assisting an underpowered crew. The cockpit is T-shaped, with a 1300mm diamater wheel driving a Whitlock Mamba mechanical steering system. Behind the wheel is a contoured helming seat, the centre section of which hinges to form a walk-through to the swim platform. Access to the lazarette is through the outer sections of the helm seat. Liferaft stowage is in transom compartments accessed from the swim platform. 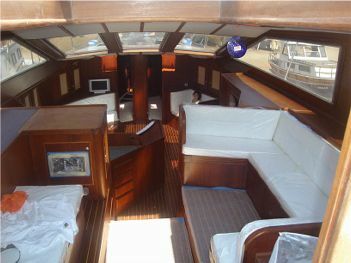 Down below, the deck saloon contains settees, the nav station, inside steering and a watch berth. A folding table converts it into a pleasant social area for dinner parties. It is open plan to the saloon and galley below, resulting in an expansive main living area. Down the companionway the galley is to port, with wide work surfaces and large lockers and freezer, suited to all food preparation needs whether cruising or chartering. Opposite the galley is a double cabin with en-suite heads which doubles as the general heads for day guests. Alongside the companionway to starboard is the oilskin locker. The saloon has an eliptical dining area to seat 8 and a pair of 2-seater settees to stretch out and relax. Both sides of the saloon have extensive locker areas for books, TV etc. A bar is in the central console of the dinette backrest. Up front are mirrored double cabins with upper and lower berths and a shared forepeak heads, alternatively a workshop as shown here, in place of one of the cabins. A collision bulkhead separates the heads from the rope locker, which is accessible through either a watertight bulkhead door or a deck hatch. 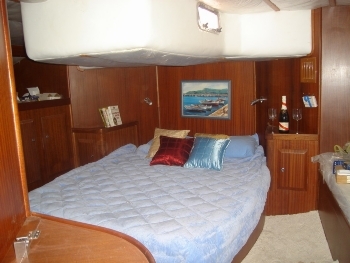 The aft accommodation is the owners cabin, with a large double bed, settee, dresser and extensive lockers. The en-suite heads has a separate cubicle with sitz bath and shower. Under the deck saloon is the machinery space, housing all powering and generating equipment. Powering is through twin hydraulic drives sited at the aft corners of the area. Their situation is irrelevant to the engine placement so they can be well spread to give excellent manoeuvring control without having to spread the engines. They also open up other powering options, allowing a choice between one large engine (100 to 200hp) or two smaller units. Twin diesels driving saildrives or conventional shafts would also be possible. 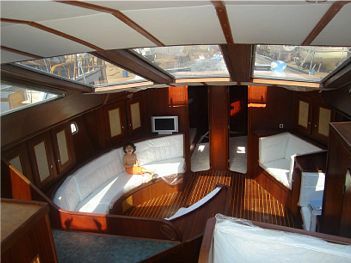 The configuration of this boat was drawn to suit the client who commissioned it. Alternative possibilities to suit other owners are endless. A cutter or sloop rig is a natural progression for a boat of this type, as is a layout better suited to charter work. Follow these links to a stability curve and a list of drawings for this design. Dix 61 being built by Ozcan Bilik in Turkey. She is to have the cutter rig.